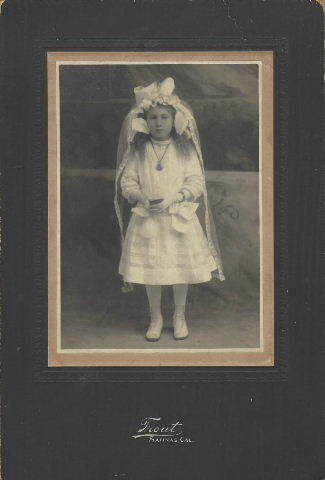 Mystery Photo: Who is This Little Portuguese Girl? This week’s mystery photo is actually two photos involving the same unknown little girl. These were in the collection of Marie Gloria (Bonita) Medeiros, my grandfather’s cousin. They were shown to me by her granddaughter, Barbara. The girl has Portuguese roots and was born in either Hawaii (most likely Kauai) or California. The first photo is a Communion Photo. The frame states that it was taken at the Trout Studio in Salinas, Monterey Co., CA. The second photo shows the child with two woman who are known to me. The women are Marie Gloria (Bonita) Medeiros, who owned the photograph, and her aunt, Maria (Jacinto da Camara) de Braga (aka Mary DeBraga). Maria is Marie Gloria’s aunt. I have another photo taken around 1910-1912 where Maria DeBraga is wearing the same dress. I do not know the significance of the two woman and the child posing together. Is one of them the little girl’s godmother? Or, was it just a day spent together with relatives capped off with a photo? I have wondered if the girl is one of Bonita children that lived in Monterey County. They had the surnames Bonita, Jose/Joseph, and de Ponte. That would make her Marie Gloria’s cousin. There is another possibility. Maria (Jacinto da Camara) and Jose de Braga (aka Mary and Joseph DeBraga) had no children. They adopted Isabella (Pacheco/DeBraga) Ventura, the daughter of Joao Pacheco and Joana Gonsalves Cardosa. Isabella was born in 1903 in Kilauea, Kauai. 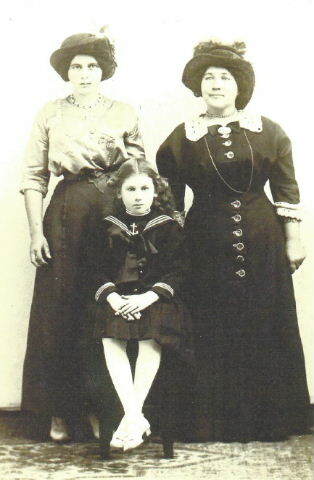 When her father died in 1906, her mother gave a couple of her daughters away to family. If this is Isabella, she would have been 7 in 1910. Does the age fit this little girl? If anyone can identify her, please leave a comment. I would love to give her back her name. She clearly meant something to Marie Gloria since she saved two photographs of her.